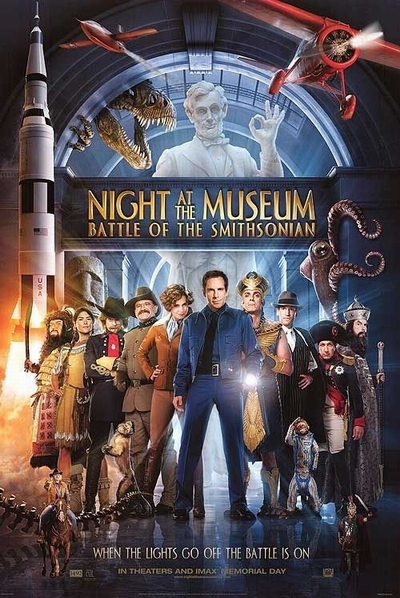 Story: In this second installment of the saga, Larry Daley (Ben Stiller) has left behind the low-paying world of guarding museums to become a sought-after inventor of Daley Devices infomercial products. He seems to have it all -- but something is missing in his life, something that draws him back to his old haunt, the Museum of Natural History, where he once had the magical night of a lifetime. There, he makes an unsettling discovery. His favorite exhibits, indeed some of his truest friends, have been deemed out-of-date. Packed into crates, they await shipment to the vast archives of the Smithsonian. Now, Larry must try to save his formerly inanimate friends from what could be their last stand amid the wonders of the Smithsonian, all of which, from the famous paintings on the walls to the rocket ships in the halls, suddenly have a mind of their own.